Peter Molyneux has got a lot to answer for. 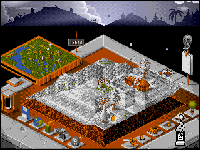 If he had not invented Populous, we would not have all those copycat games like Mega-lo-Mania and The Settlers. Now French bods Microids have added another god game to the pile with Genesia, a tale of tribes, trials and mystery jewels. You are responsible for a clan of settlers who have set up home on one of five worlds. The aim is to help them prosper and lead contended lives by improving their economic and technical status. Only then can you start looking for the jewels. To help you, each band of settlers can be split into eight occupations including architects, inventors and farmers who can design and construct buildings, exploit natural resources or research and develop new technology. This all costs money and materials, so you also have to manage your tax rate and stop your people starving or causing an ecological disaster. Get it right and you are rewarded with a flood of new arrivals in your colony as well as technical and military superiority over your rivals. Get it wrong and you could be going to bed much earlier than you thought. All this is pretty standard fare if you are interested into god-games and Genesia does it all very well. Being able to get inside the buildings and talk with the inhabitants is a nice touch and the seasonal fluctuations make the gameplay unpredictable. On the downside, Genesia is so similar to its more illustrious god game predecessors it is inevitable you should compare them. 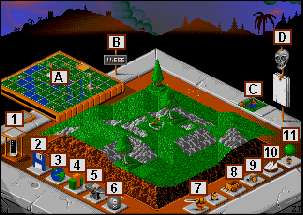 It shares a virtually identical isometric game screen with Populous, complete with icons and a mini-map around the edge. The way inventions are linked to make a whole, remind you of Civilization, while the construction and task elements remind you of The Settlers. Unfortunately, these overwhelming similarities just make you think of how great the originals were and you find yourself wishing you were playing them instead. Genesia has other problems too. It takes ages to get anywhere because you have to sit through the other two players' moves, whether they are Amiga-controlled or not, and you are confronted with almost constant disk accessing. Combine this with the fact that it takes forever tog et enough resources and people together to expand your empire and you are left with a game that demands a lot more form you than it gives in returns. LEVELLING THE LAND A guide to the icons you can use to create your world. A. MINI-MAP: gives you an overall view of your world. B. GOLD: tells you how much money you have. C. BUILDING SELECTED: shows you a picture of the building currently under construction. D. ACTION POINTS: Each military unit is given a limited number of movement points displayed here. 1. HOURGLASS: each player is allocated a time period to make their moves, indicated here. Click on the button if you want to skip a turn. 2. DISK: click to save your current game or load an old one. 3. WORLD: gives you an enlarged view of the world map shown in the mini-map section. 4. STATISTICS: click here to see your empire's status in terms of population growth, resources and fertility. 5. DESTRUCTION: get rid of unwanted obstacles such as trees, lakes and so on which may be blocking your path. 6. CONSTRUCTION: you can select a major building for your architect to create as well as roads, fields and wells. 7. COMBAT: go to any battlefield where your troops are currently engaged. 8. ARMY: soldier units are essential for expanding your empire or defending it. Click to go to any available units. 9. WAGON: can be used to move goods around different warehouses or for transporting raw materials to shop where they can be sold. 10. BOATS: enables you to sail across the oceans and colonise other parts of the world. Click here to go to any available units. 11. BALLOON: useful for spying on enemy territory and dropping bombs on buildings or hostile troops. Click here to go to any available units. Reminiscent of Populous, but good-looking nevertheless. Limited animation. The in-game music is a bit tedious, but the sound effects add atmosphere. Becomes increasingly enduring the more you play it. A grower, not a stunner. It will take weeks for you to get anywhere. It is no doddle either. Genesia tries to outdo Populous and The Settlers but ultimately fails to do either. Despite this, it is a challenging and occasionally rewarding god game. Die eigentlich schon längst wieder abgeebbte Welle von göttlichen Weltensimulationen à la "Populous" haben "Die Siedler" erst kürzlich wiederbelebt - jetzt will Mindscape noch eins draufsetzen! Die Götter müssen hier zwar nicht verrückt sein, aber daß sie ziemlich sauer wurden, als ein liebeskranker Prinz die sieben heiligen Juwelen mopste, um damit bei seiner Angebeteten Eindruck zu schinden, ist schon irgendwie verständlich - in ihrem Zorn legten sie gleich das ganze Prinzenland in Schutt und Asche. Inzwischen sind etliche Jahrhunderte vergangen, und drei menschlich oder elektronisch gesteuerte Blaublüter machen sich daran, das verwüstete Land wieder aufzubauen und gleichzeitig die verschollenen Klunker zu suchen. Dazu müssen sie auf einer von insgesamt vier Landkarten unter Zeitdruck ein voll funktionsfähiges Königreich auf die Beine stellen, wofür ihnen jeweils ein Bonsai-Volksstamm von (anfänglich) vier Leuten zur Verfügung steht. Die Kerle können diverse Berufe ergreifen, wobei zu Beginn der Entwicklung vornehmlich Bauern, Holzfäller, Schreiner, Architekten und dergleichen handfeste Proffesionen mehr gefragt sind. Während die Jahreszeiten langsam wechseln, erteilt man ihnen via Maus und Icons seine Befehle, um erst mal die Grundversorgung der Bevölkerung mit Brunnen, Lebensmitteln und Wohngelegenheiten sicherzustellen. Im weiteren Verlauf schlägt dann auch die Stunde der Ingenieure, Erfinder, Ärzte und Feuerwehrleute, da das junge Gemeinwesen ständig komplexer und zudem gelegentlich von Seuchen, Naturkatastrophen und anderen Schicksalsschlägen heimgesucht wird. Außerdem sollte man beizeiten an die Errichtung von Tempeln, Schlössern, Kneipen und Finanzämtern denken, damit man sein Volk per Religion, Steuerschraube und abendlicher Belustigung unter Kontrolle haben kann. Sollte dessen Motivation nämlich zu stark absinken, ist es Essig mit dem Fortschritt! Selbstverständlich herrscht in der Staatskasse praktisch immer Ebbe, so daß man kaum an der Erschließung von Handelsrouten und der Ausrüstung von karawanen vorbeikommt. Erfahrungsgemäß ist zwar nicht mal der ärgste Feind einem guten Geschäft abgeneigt, trotzdem freut sich die Händlerkaste über die zusätzlich Absicherung durch einen zeitweiligen Nichtangriffspakt. Aber weil sich die Nachbarn früher oder später doch unangenehm bemerkbar machen, sind solide Befestigungsanlagen, Kanonen, eine einsatzbereite Schiffsflotte, bombige Fesselballons und ein stehendes Heer nie verkehrt. Und das Militär braucht man schließlich, um selbst neue Ländereien zu erobern und nach den Juwelen zu suchen, was einem (neben der Vernichtung aller Feinde) aucn den Sieg sichert. Bereits der hübschen Grafik in Iso-3D ist die starke innere Verwandtschaft mit "Populous" deutlich anzumerken. Dazu kommen einzelne Elemente aus "Powermonger", "Rings of Medusa" und sogar ein paar eigenständige Features. Man kann seine Leute dabei beobachten, wie sie Bäume fällen, in den Minen arbeiten, die Felder bestellen oder in die Schlacht ziehen; auf dem A1200er gibt es noch mehr Animationen, etwa fallende Blätter im Herbst und niedliche Schneeflöckchen zur Winterzeit. Auch der Sound ist sehr fein geworden, vor allem die FX mit ihrem Vogelgezwitscher, Froschquaken, Wolfsgeheul und dem pfeinden Wind erzeugen die richtige Atmosphäre im Ohr. Erste Wolken ziehen bei der gewöhnungsbedürftigen und nicht immer logischen Maussteuerung auf, deren Menüs sich hinter zahlreichen Icons verbergen, die im Stil von "Populous" um den scrollbaren Kartenausschnitt gruppiert wurden. Weitere Menüs finden sich in einigen speziellen Gebäuden (z.B. Tempel), die auf Anklicken auch eine nette isometrische Innenansicht zum Vorschein bringen. Das Gameplay erreicht ebenfalls nicht ganz die Klasse der Vorbilder - besonders die Startphase ist dank des unübersichtlichen Handbuchs recht frustrierend. 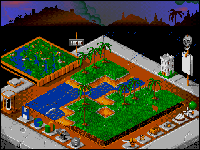 It looks like Populous, Mega-lo-Mania and other god games. Cos it is. Got jewels, though! I have decided that I have become far too important and busy to waste my time playing complicated strategy games. So for the purpose of this review, I am going to employa stunt reviewer. (Enter a six-foot, slimly built, brownhaired figure with a persecuted air about him. From a distance, if he was moving fast enough, he could almost to be mistaken for Jonathan Davies. He begins to speak). "Hello. Er. God sims, eh? And that is just was Genesia is. How do you pronounce that, by the way? Gen-ess-ia? Or Gen-ee-sia"? I phoned up Mindscape to ask them about 'Gen-ess-ia... Gen-ee-sia... or however you say it', but they did not take the bait. (I think they thought it was stupid, actually). Maybe it is obvious if you are a fan of a particular heavy metal group, or read a certain sort of fantasy book, but for some reason I could not get my tongue around it. Luckily you do not need to say it to play it, of course. It is a god sim, you see (did I mention that? ), and god sims just happen to be my favourite sort of game. I used to play a lot of board game conversions - Mah Jong ones being a particular favourite, although I still have not worked out exactly how the rules work, and all the Chinese writing gets me confused - but... oh yes, god sims. Genesia will hold few surprises for you if you have played lots of this sort of thing before. It has got the usual Populous-style 3D landscape, rendered in delightfully pretty graphics which change with the seasons, of which you own a square-shaped chunk. You start off with just a couple of people living in little houses, and from there you have got to huild up a mighty empire. Impeding you are two other players, who begin in similar circumstances, and can be controlled either by the computer or by a couple of strategy-loving mates. In the latter case you both need to type in your names so the user interface may converse informally with you, although I still have not worked out how to get it coming out as anything other than ' ', which looks a bit stupid. "Your go, ," it says. So what can you actually do in this 'go' of yours? Well, you cannot alter the terrain in any way - it is fixed into place. What you can do is appoint tasks to the people living in your village. You can make some of them architects, who build things; some can be farmers, wo make food; some can be woodcutters, who cut down trees; some can be carpenters, who make the trees into planks; some can be inventors, who invent the vehicles and weapons you will need once you start conquering things that take ages by the way and it will be several days before you even manage to get your population into double figures if you are anything like me; some can be blacksmiths who help the inventors to make things; but you cannot have sandwich men, whoch seems a shame. Or behavioural psychologists. And once you tire of such peaceful creativity, and your blood-letting instincts begin to take a hold, you can begin to build a war machine. This involves recruiting an army and equipping them with the fruits of your inventors' labours, and also protecting your village (or city, as it will probably be by now) by building walls around it. Your task is to either a) kill everyone else, and take over the whole map, or b) seek out - and this is where Genesia's adventurely element comes in - seven mystical jewels (or similar) that are scattered around the... Argh! (The helicopter which, as he was speaking, he had grabbed hold of and been carried several hundred feet into the air by, becomes entangles with a flock of migrating geese, loses a rotor blade, pirouettes into the sea and explodes. He dies). Damn. Oh well, at least I get to keep all the money this way. I did have a bit of a go on Genesia myself, actually, and it seemd pretty much okay. The graphics are, indeed, quite lovely, as are the sound effects, which (like the graphics) change depending on the time of year and what you are looking at, and it makes for a reasonably absorbing hour-eater. I could only find three tangible flaws in it, in fact, and even these are not that major: 1) the disk accessing that occurs when you click on just about anything, which I really cannot see the need for; 2) the way the players all have to take it in turns, even when you are playing only against the computer, which lends the proceedings a much more tedious wargamey air than is strictly necessary; and 3) the way it takes an absolute eternity to get anywhere - there are only five levels, but conquering just one of them will be the work of several evenings, making it all the more frustrating if things start to go wrong and you begin wondering if you are going to win or whether you would be better off starting again. Oh yeah, and there is just one other thing: there is nothing actually new here. It is yet another variation on the old Populous/Powermonger/Mega-lo-Mania/whatever theme with the variables tweaked slightly. The jewel-collecting stuff does add an extra dimension , it is true. But even so, if you have already got two out of the games mentioned above, you would have to be a very special sort of person to want this one as well. Basically pretty great all round, then, nothing new, and it will only truly appeal to professionally-trained strategy buffs who already have all the necessary safety equipment. UPPERS Great to look at, with loads of detail packed into every pixel. Not that this is what is at stake here - what we need is strategy by the 200-page-manual-full, and there is plenty of that as well. The jewel-hunting subtext takes away the aimlessness that can often infect these things. DOWNERS It is slower paced than this sort of game usually is, and the disk accessing does not help. You will need to be incredibly patient with it - there is no use expecting instant rewards. The scrolling is rather poor. Looks nice, and everything works properly. Set aside a few days and you might even see a hot air balloon or something. But it lacks that... er... the... er... (help!) er... okay, the 'Sherpoom!' necessary to make it stand out from the Mount Olympia-load of perfectly good god sims you could buy instead. There are no special enhancements for the A1200, so you get the same as everyone else. Still, it is quite pretty anyway. Really. Ish.